Can I pay a bigger compliment than to visit a restaurant again? Well, I guess, bringing a friend (my childhood best friend, Yumiko, is visiting from Japan) is yet another notch up. So, obviously, I enjoyed my first visit to Alta, but I think we enjoyed it even more this time. Right off the bat, their Fried Goat Cheese with Lavendar Scented Honey is a must have! While fried goat cheese is always great, this is the lightest version we’ve ever had. The cheese seemed to be herbed and whipped. 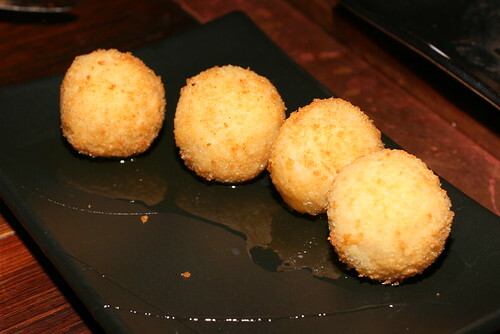 The coating was similar to panko, perhaps a finer ground version. Just fabulous! 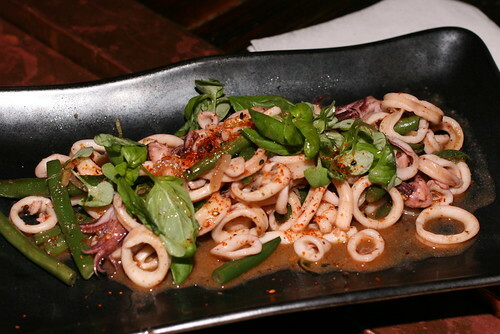 The Wok Seared Calamari with Haricot Verts was a generous portion of tender pieces, perfectly seasoned and nicely balanced. 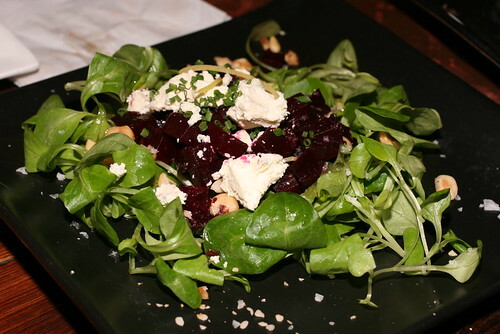 The next dish was Tunisian Spiced Roasted Beets, Afuego l’Pitu Cheese, Toasted Hazlenuts, and Field Mache — now that’s what I call a salad! The combination was sensational, taking tangy, sweet, and salty to a new level of sublte perfection. Of course, every ingredient was super fresh. The Avocado Relleno, stuffed with crab meat and shrimp, was impressive in its construction, but not so much in its taste. 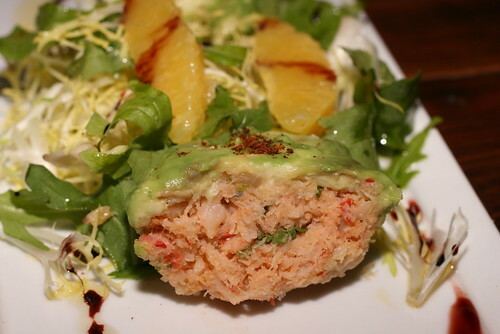 It is layers of thinly sliced avocado wrapped around crab meat. The Prince Edward Islands (P.E.I.) Mussels in Harissa Lobster Broth was an extremely large portion and we loved every bite. 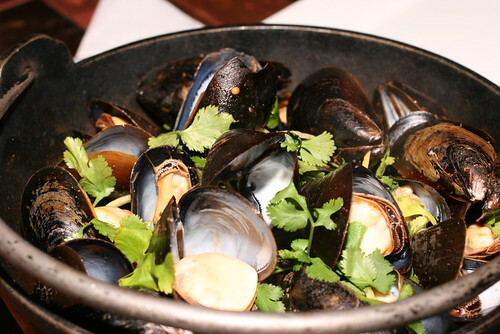 The preserved lemon and cilantro was strong, the mussels were plump, resulting in a lot of character. We requested some bread to sop up the broth and they were happy to accommodate. 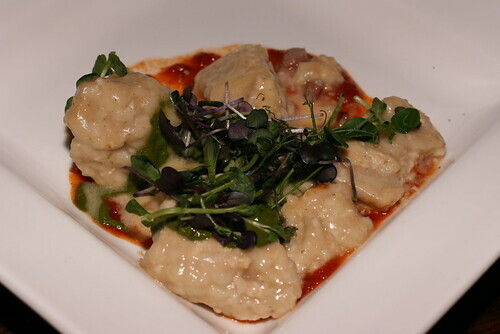 The only dish of the night that disappointed me was the Ricotta Parmesan Gnocchi. They were tough globs and Lon thought they were more like ravioli than gnocchi. 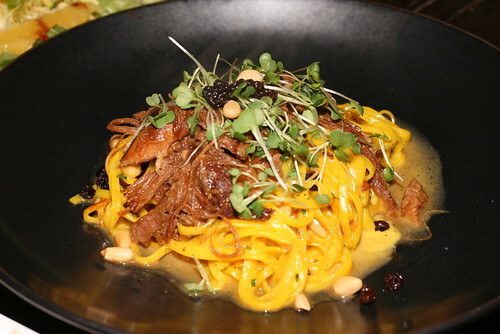 The Saffron Truffle Tagliatelle with Wild Boar, Grappa, Creme Fraiche, Pine Nuts, and Dried Currents was another huge hit. We couldn’t really taste any saffron but the rest of the ingredients really played into a complex and unique flavor. The noodles were a wonderful texture. 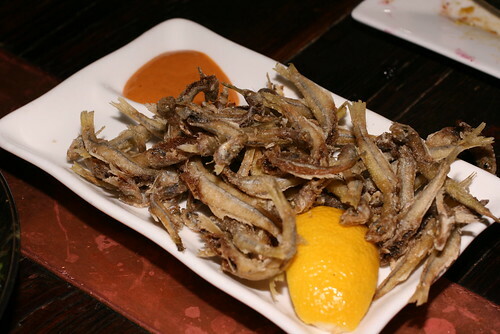 The Crispy Fried Smelts were simple, yet so good. They were not at all oily and we could see that each individual fish had their guts cleaned out. 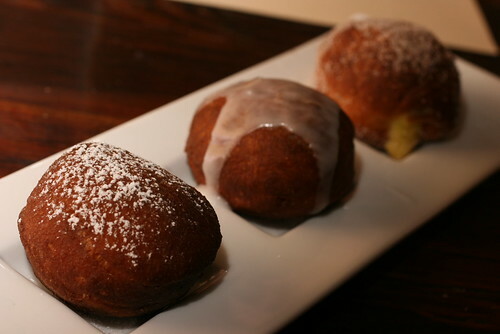 We ended with a Doughnut Trio. All three of us favored the one with Cardamom Cream, although none of us tasted the cardamom. The Chocolate Hazelnut Ganache was also good, but all of us thought there was too much Apricot Lavendar Jam in the third one. It overpowered the doughnut because it was so thick (more of a paste). Still, they were all hot and fresh. Lon also decided to do a flight of white dessert wines. No surprise that I liked the Rioja Blanco Semi Dulce (Franco Espanolas 2001) since I like things less sweet. Lon and Yumiko were both torn between the Jurancon Moelleux (Domaine Cauhape 2005) with some pepper undertones and the Quarts Du Chaume (L’Echarderie) which was extra sweet. 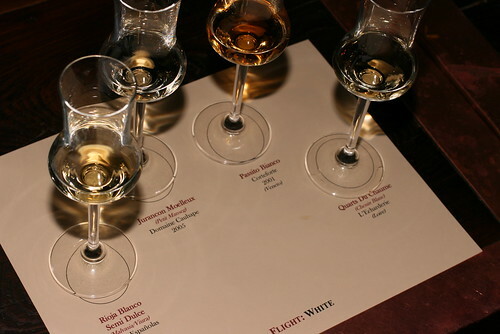 None of us liked the Passito Bianco (Corteforte 2001) because it tasted like drinking perfume. The service was very good all night, especially considering how busy the restaurant was. The one misstep was when they forgot to bring the tea during dessert. We ended up canceling the item and they removed it from the bill without discussion. All this for $130 (including tax and tip) for three very happy and very full people. As I mentioned last time, I don’t even mind when one or two dishes miss the mark because the prices lend to trying and the overall experience is so positive. posted by jessica	at 09:12 AM	Filed under Favorites, Fusion or Mixed, Restaurants. You can follow any responses to this entry through the RSS 2.0 feed. Both comments and pings are currently closed. I’ll be in NYC in March–I’m adding Alta to the list! Too bad about the saffron, although considering it’s the most expensive spice around and restaurants are struggling, I wonder if they are skimping…hope that didn’t jinx them. Dr. Food, yay! I’m glad you have Alta on your list…where else? Wow Knife, twice in two days!